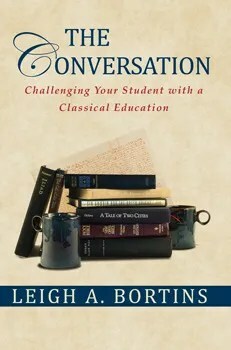 Classical Conversations offered The Conversation, by Leigh A. Bortins for the Schoolhouse Review Crew to take a peek at. 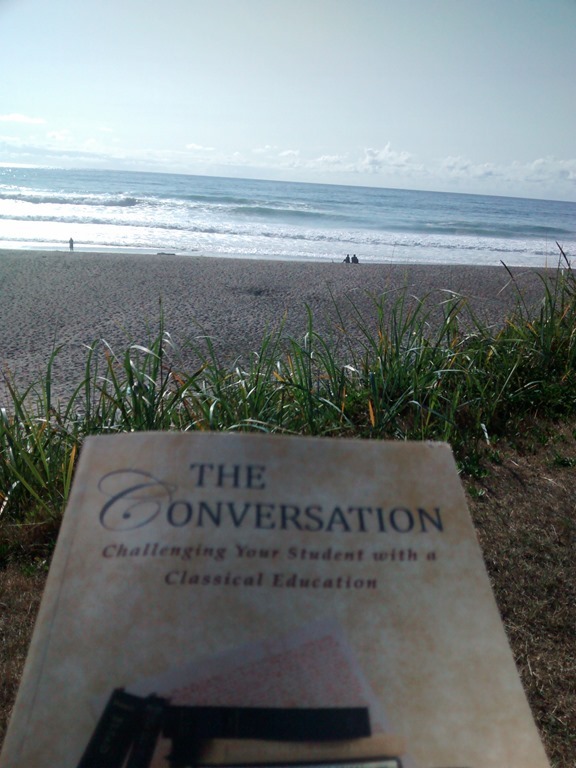 The tagline had me, “Challenging Your Student with a Classical Education.” She didn’t use the words continuing or finishing, but rather – Challenging. I will be starting my final student in the 9th grade this year. He’s come up behind his brother, co-ops, older friends, and three moves since starting school. He is the outside. The listener. His focus is on friends, sports, food, and music. Each year that we’ve gone to do solid studies, he has already obtained information from being that ‘fly on the wall’. This year, big brother is fully at college, as he was for most of last year. So little brother will be on his own. We live in a small town with a handful of homeschoolers. The two other homeschool boys our age are doing different things. The others are much younger. So starting out the book with the chapters on how fun it will be together with other homeschoolers and all of the possibilities there are with groups – doesn’t quite match our situation. We have lived in two towns like that, but not right now. This is where the action comes to play. I’ve known about the Grammar and dialectic stages of learning – acquiring knowledge and facts, and then assessing order and information as he understands it. 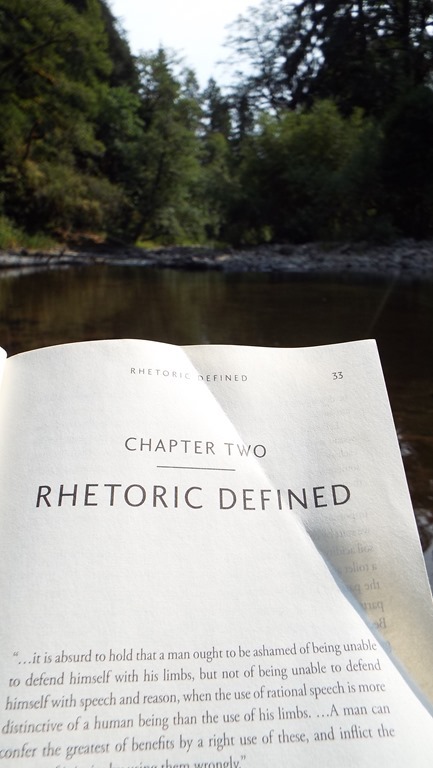 “Rhetoric is the culmination of what your student has practiced in the early ears of his education.” “Your student will use his knowledge and understanding to develop wisdom”. (page 39) We get to see the fruit develop from the first 8 years of learning. My question is – How? We learn about the five cannons of Rhetoric: Arrangement, Elocution, Memory, and Delivery. Each section gives detailed information of what it is, and why it is important. This is when I started to get really excited about the book. When the boys were younger, we read a lot of Ruth Beechick and other pioneers. I learned how to use simple books with Ambleside Online to pull together a fantastic home education. I followed Sonlight reading lists to ensure that the boys would be focused and not just spending time on Twaddle – A Charlotte Mason directive. Trouble is – There isn’t a lot of items for High School. With my oldest, we tried to do a lot of reading, but it pulled more to spine curriculum. There didn’t seem to be a lot of time left in the day for anything else. He’s done well. But second son does not like reading spines. I think this book will be my guide! Reading, Speech and Debate, Writing, Science, Math, Government and Economics, History, Latin & Foreign Languages, and Fine Arts. Each chapter goes over how you’d teach the topic in a Classical way. Conversations that could be sparked. Questions to ponder and answer. There is a table at the end of each chapter summing it up – Investigating (Math), using the five canons of rhetoric: and then leads a student through about a dozen questions. You’d know from the answers if the knowledge gained has fully developed into understanding and wisdom. I believe that by really digging into these subject related chapters, that I’ll be able to use any resource to help my 9th grader ease into the Rhetoric stage and shine through the next four years. The end of the book happens to be A Graduation Conversation. The final Appendix of the book has games and resources to help you along. I’ve read through the book once during the review period. I plan on keeping this in my backpack for quite some time. 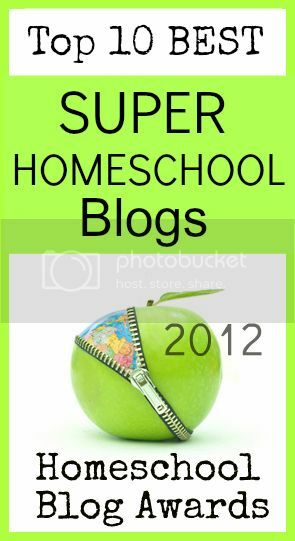 It will become a new staple that I recommend to high school homeschool moms. I don’t want to merely skip along the next few years checking off academic boxes. I want my son to grow in knowledge and wisdom. This book, will help direct my role as a coach, mentor and teacher. Check it out! 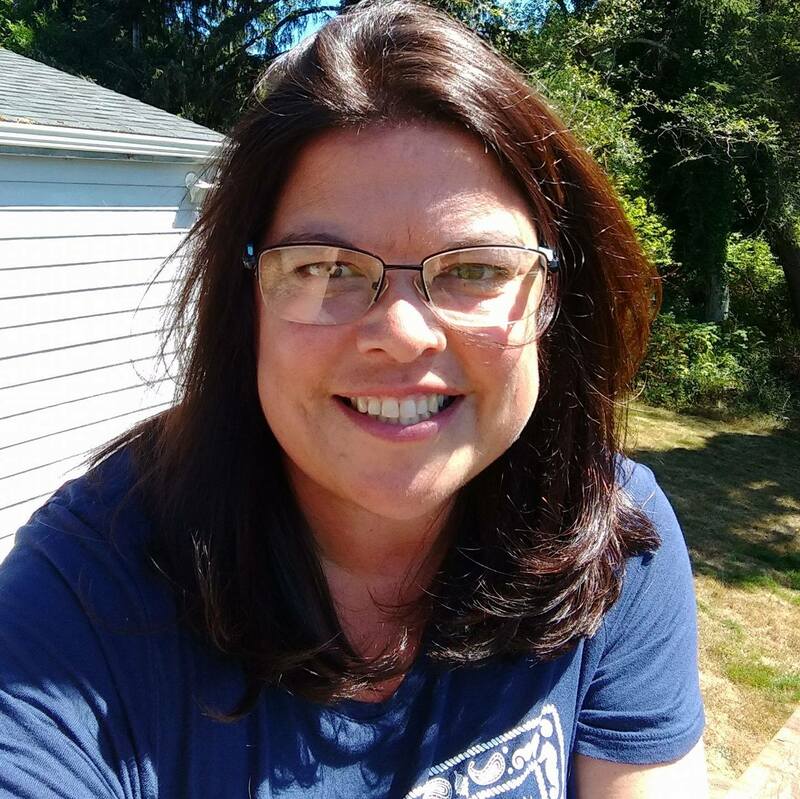 This entry was posted in Language, Logic, Reviews, Schoolhouse Crew, Some Schooling and tagged 9th grade, Art, fine arts, freshman, how to, hsreviews, Math, questions, reading, rhetoric stage, Science. Bookmark the permalink.